The Hello hitmaker has been on the music scene for around 50 years, first embarking on a career in music with his group the Commodores before going solo in 1982. 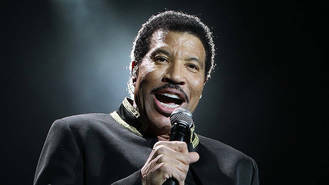 And it seems a stint on television could be next for the star, who turns 68 on Tuesday (20Jun17), as insiders have told TMZ that American Idol bosses are eyeing him up to lend his expertise on the next series of the singing competition. The show ended its 15-season run on Fox last year (16) but will be brought back to life by ABC for the 2017/2018 season. "American Idol is a pop-culture staple that left the air too soon," president of ABC Entertainment Channing Dungey previously said in a statement. "ABC is the right home to reignite the fan base. We are thrilled viewers will once again share in these inspiring stories of people realising their dreams." Cheryl Cole is praising boyfriend Liam Payne as an "amazing" dad on his first Father's Day (18Jun17). Bob Geldof beamed with pride as his daughter Pixie wed her rock star boyfriend George Barnett in Mallorca on Saturday (17Jun17). Taylor Swift is reportedly working hard to help her new boyfriend break into Hollywood. Karen Elson waited to release her music because she feared she would be ridiculed. Rita Ora volunteered to help sort through donations for victims of the Grenfell Tower blaze on Wednesday (14Jun17). Pop star Camila Cabello has given her former Fifth Harmony bandmates' first single since her exit the thumbs up. Coldplay have recruited veteran rocker Brian Eno to create a mobile app to enhance the sound of their new track Hypnotised. Beyonce has sent fans into overdrive amid rampant speculation suggesting she has gone into labour.